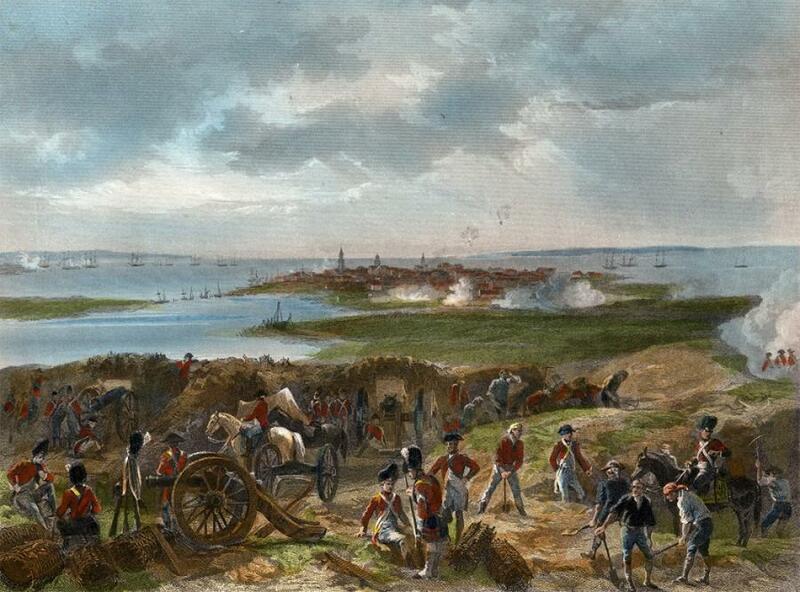 A depiction of the Siege of Charleston (1780) by Alonzo Chappel. The regiment would quickly prove to be a military asset the British. By June 1778, the Volunteers of Ireland had participated in the Battle of Monmouth Courthouse in New Jersey, followed by the Mathew-Collier Raid in Portsmouth, Virginia in May 1779. The regiment was then sent to Charleston, South Carolina in December 1779 where they fought with distinction. The Volunteers were participants in the Siege of Charleston in April 1780, fought at the Battle of Camden (South Carolina) with General Cornwallis on August 16, 1780, and at Hobkirk’s Hill (Camden, South Carolina) under Lord Rawdon on April 25, 1781. They had been placed on the American establishment as the 2nd American Regiment on May 2, 1779 and were then taken into the British Army as the 105th Regiment of Foot on December 25, 1782. In August 1783 the regiment—mainly composed of officers at this point—went to Ireland, then were officially disbanded in England 1784. Near the end, veteran soldiers of the regiment had also been sent to provincial regiments in Charlestown, particularly the Prince of Wales American Regiment, New Jersey Volunteers, and DeLancey’s Brigade, many of whom were shortly resettled in the region which later became the Maritime Provinces of Canada. An example of a possible career of an Irish Catholic loyalist soldier can be found by following a name through a trail of muster rolls: Patrick Donnelly. He first appears in the rolls of the Roman Catholic Volunteers from 1777 to 1778, then in the Volunteers of Ireland from 1779 to 1782 (see the Index from Library and Archives Canada for the British Military and Naval Records). The name next shows up amongst the ranks of the Prince of Wales in 1783, followed by appearances in land petitions from veterans of that regiment in St. John County and York County, New Brunswick. There is the possibility that it was more than one “Patrick Donnelly” who generated these records, but the dates on the documents do follow a plausible timeline. 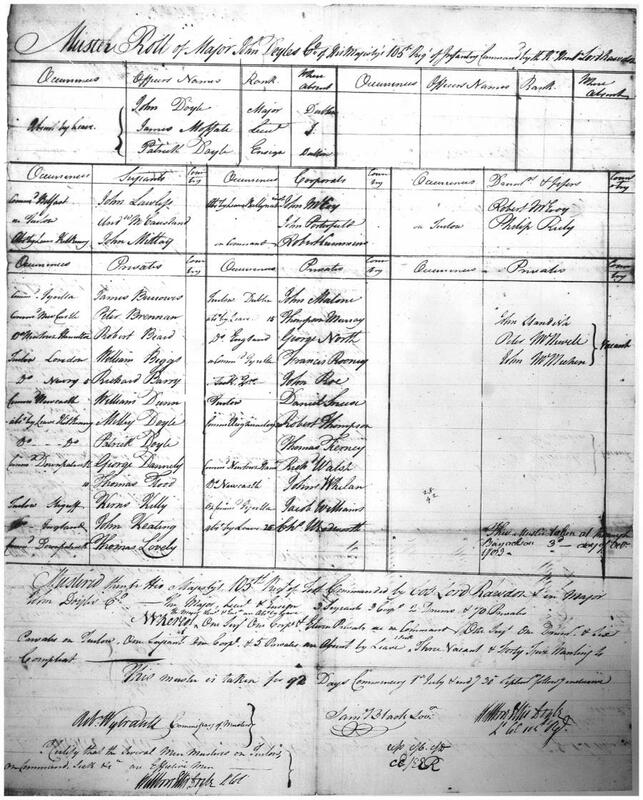 Muster roll of Major John Doyle’s company of the Volunteers of Ireland/ 105th Regiment of Foot taken at the barracks at Killough, County Down, Northern Ireland, October 1783. Although on the surface, early Irish Americans, particular Irish Catholics, would not be an obvious population from which to draw loyalist military support in the colonies; they did, however, form the basis for two provincial regiments, one a failure, and one which became an accomplished unit. The Irish role in the American Revolution merits more in-depth investigation to untangle the complex pressures at work in ethnic, religious, and national allegiances. See New Brunswick Loyalist Journeys story maps for the biography of an officer of the Roman Catholic Volunteers, Samuel Richard Wilson. Todd Braistead, The On-Line Institute for Advanced Loyalist Studies. Rene Chartrand and G.A. Embleton, American Loyalist Troops 1775-84, Oxford: Osprey, 2008. Harry T. Dickinson, “Why did the American Revolution not spread to Ireland?,” Valahian Journal of Historical Studies Vol. 18-19 (2012-2013), pp. 155-180. Leroy V. Eid, “’No Freight paid so Well’: Irish Emigration to Pennsylvania on the Eve of the American Revolution,” Eire-Ireland Summer 1992, Vol. 27 Issue 2, p35-59. 25p. A.W. Haarmann, “The Roman Catholic Volunteers, 1777-1778,” Journal of the Society of Army Historical Research 49 (1971), pp. 184-185. Philip R.N. Katcher, King George's army, 1775-1783: a handbook of British, American and German regiments, (Reading : Osprey Pub., 1973). Robert Kee, Ireland: A History, London: Abacus, 1998. J. S. McGivern, “Catholic Loyalists in the American Revolution: A Sketch,” CCHA Study Sessions, 48 (1981), pp. 91-99.